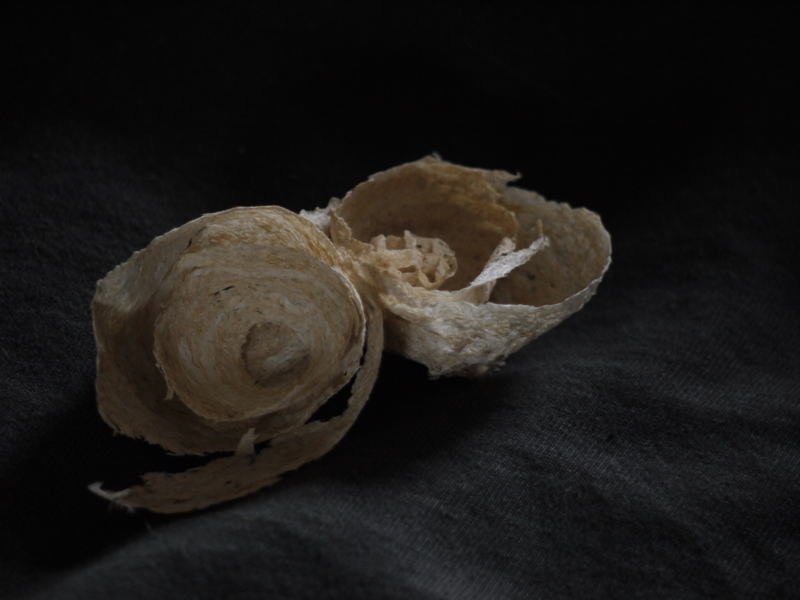 In June, Philip found what was either a tiny wasp or hornets nest underneath a tarpaulin in the wood. The nest was in its early stages, about the size of a quail’s egg and had 11 empty cells tucked inside. It had to be removed from its location so we may have disturbed the queen, although we were around the area for some time and saw no activity. I really can’t be sure if it’s a wasp or hornets nest. Both are made out of chewed wood, mixed with saliva and made into a paper like material. Even the specific location didn’t help as different species build their nests in different preferred locations. I would need an expert to help with this one. I took the nest home and forgot about it until recently. Here are my musings and a little research on the subject of wasps and hornets. I recall sitting in a café in the Malverns a few years ago, discretely trying to cajole a wasp out through an open window next to our table. It wasn’t bothering anyone and was crawling up the glass trying to escape the room. An elderly gentleman on the table behind, lent over and rather adeptly killed it with one swipe of his newspaper. As it dropped dead to the windowsill, he proudly announced with a smile, “another one gone”. I merely nodded without expression and went back to my cream tea but was actually rather irritated. In my experience that’s pretty typical of a reaction to wasps. Anaphylactic shock issues aside, I do struggle to understand just killing them for (in situations like this) no good reason. I’ve often shared jam with a wasp and they’ve not been a tiny bit aggressive, perhaps as I haven’t flapped and upset them? Keep calm, just let them take a sip of your drink or nibble of your jam and soon they’ll leave you in peace. Having said that, I do understand the hatred and fear of wasps. In my early teens I was stung by one but insisted the offender was let out of the window. I’d unwittingly put my hand on it, so it was only defending itself (and I can’t say I blame it). Wasps only sting in self defence, which includes when we are flapping at them. Admittedly though, I never want to be stung again and they can be annoying. • Wasps are important pollinators. • The wasp sting enables them to capture and immobilise their prey and is also used to protect their nests. There are approximately 9,000 species of wasp in the UK. These include parasitic species (some so tiny they can barely be seen without a microscope) and 250 species of the larger wasps which have the sting. Only 9 species of the 250 are the social species which build the large nests. The majority are solitary and cause no issues to us at all. Wasps are rarely seen in late spring or early summer because they are busy building their nests. During this time we may see just a few large queens looking for suitable nest sites such as abandoned mammal holes, cracks in walls or holes in trees. When the queen has made 20-30 cells inside the nest she starts laying her eggs. She also secretes a chemical into the nest which repels ants. Late summer is when we tend to see many more wasps; these are adult workers looking for food (sugars) for themselves and proteins (insects) for the larvae. The adult wasps bring insects to feed the larvae and in exchange receives a nutritional droplet containing carbohydrate secreted by the larvae. But towards the end of September most of the larvae have grown and left the nest so the adult wasps are not receiving their nutritional droplet. This is why you might spot them buzzing around your crisps as well as your jam later in the year. A colony only lasts one year and when the queen leaves, all the others die. After mating in late autumn the new queen overwinters in a sheltered place and so the cycle starts again. And a little tip – you should avoid killing (or injuring) a wasp as it releases a chemical that signals to others from the colony to attack (although for the entire colony to attack, the death would need to occur within 5m of the nest). Some birds such as starlings, magpies and blackbirds eat individual wasps (not whole colonies). Hornets, spiders, centipedes and dragonflies have also been known to eat wasps whilst badgers, weasels and mice will feed on the filled combs inside the nest. Hornets typically nest in trees and are drawn to lowland, mature, deciduous woodland (so our little nest may possibly have been hornet) but will also use nearby gardens with mature trees. The size of hornets can be quite scary (queens up to approx. 3cm in length) but they’re quite docile and generally only react when defending their nests. Hornets are not only larger than wasps but are chestnut brown (rather than black) and yellow. The queens appear from hibernation in early spring and build a new nest in a hollow tree, old shed, bird box or sometimes an attic (or under a tarpaulin?). The workers appear in June and generally hunt for their prey in the tree canopies, well out of our way. Their diet consists mainly of caterpillars which are fed to the larvae. Hornet adults and larvae eat mainly insects but also tree sap and windfall fruit; ivy flowers are a favourite too. They are also know to have quite a thirst so can be seen in groups drinking from puddles or at the edge of ponds. Hornets can be a problem when searching for sugary foods (jam, fruit, etc) in the late summer but only tend to sting if threatened. Although hornets have been known to attack bee hives they are not seen as a major threat to them. New queens and drones can be seen in September and October and like the wasp, only the queen survives the winter. The hornet preys on (and therefore controls) numbers of agricultural / garden pest invertebrates (as does the wasp). I’ve seen a few scary articles in the newspapers regarding the threat of the invasive Asian hornet. These were introduced into France in 2004/5 probably via the transportation of goods from China. They’ve since been confirmed in Spain and Belgium and the potential of it spreading to the UK is seen as very likely. The Asian hornet is smaller than our native hornets but are very aggressive and would pose a real threat to honey bee colonies and other pollinators, including our social wasps and other species of bee. It may seem this article isn’t very focused on Hollington wood. However, it is home to hornets and wasps (we’ve seen them – including 3 wasps crammed inside and gorging on a gooseberry) all of which play an invaluable role within the ecosystem in the wood and the wider countryside.